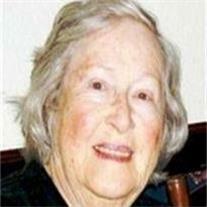 Pearl Maxine Daily Pietz of Dewey, AZ, Known to all as Maxine, was called to the eternal kingdom on July 14th, 2012. Born June 2nd 1927 to Omer and Mabel Daily in Galena Missouri. Maxine moved to Chino, California and graduated from Chino High School in 1945. She married John Pietz in 1948 and they had 5 sons. The family moved to Mesa, Arizona in 1963. Maxine walked with Christ and taught her children to pray and love God. She was an avid seamstress, taught Sunday School, was a Cub Scout leader, and served as president of the Mesa Lutheran Hospital Ladies Auxiliary. She was a member of St Peter Lutheran Church in Mesa until she moved to Dewey and was a member of Trinity Lutheran Church, Prescott Valley. She was preceded in death by her parents, Fred and Mabel Affentranger, her brother William and sons Jarman and David. She is survived by her husband John Pietz, sons Marty (Stephanie) Pietz, James (Linda) Pietz and Mitchell (Sandie) Pietz, her sister Inez, 7 grandchildren and 3 great-grandchildren. Services will be in Prescott Valley at Trinity Lutheran Church on Friday, July 27th at 10AM and in Mesa at St Peter Lutheran Church, 1844 Dana Ave, on Saturday, July 28th at 11AM.